You're in a pivotal and unique position to help your African-American relatives (including myself) learn about their Motherland roots, and to help understand more about where the descendants of your ancestors branched out in the Americas; a net-net gain. 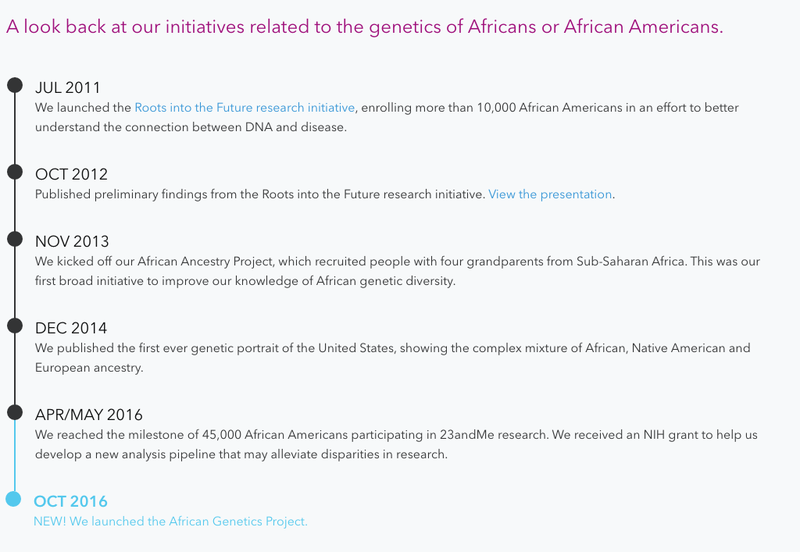 So if you're of recent African descent and currently reside in the United States, I humbly request you consider participating in the 23andMe African Genetics Project. If you qualify (see full eligibility requirements below), then you will receive a FREE 23andMe ancestry & health kit, and much more (value: $199). 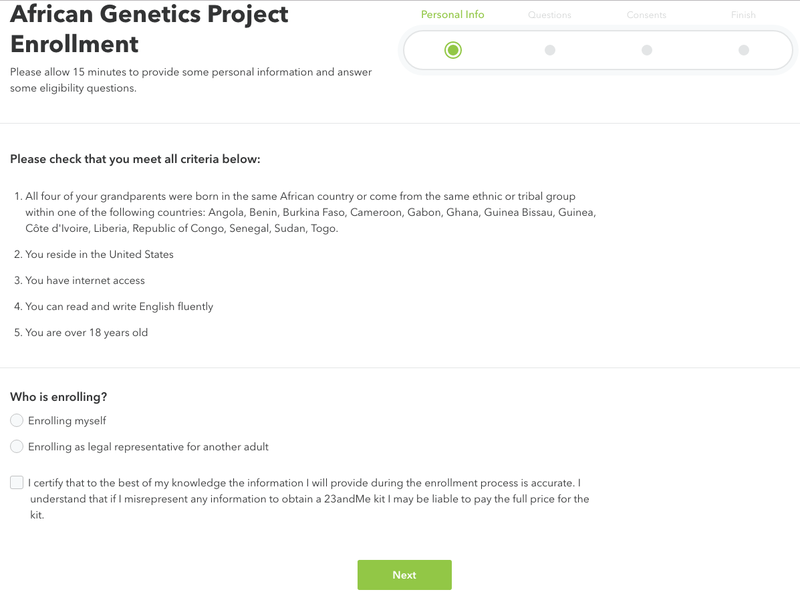 Once you sign up for 23andMe African Genetics Project and meet eligibility requirements — all four grandparents must be born in the same African region or from same ethnic/tribal group within certain countries — and submit your saliva sample, then you will receive ancestry (ie ethnicity composition breakdown, haplogroup assignments) and health reports, as well as a list of real genetic relatives from Africa and abroad. You may also be asked to be included in 23andMe's African reference population panel, which sorely needs more people like you who KNOW their roots. 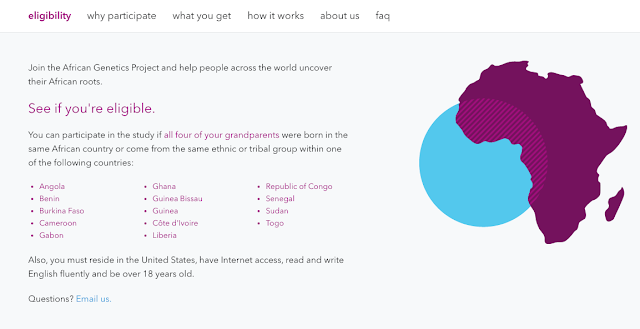 Of course the 23andMe test can help you build your own personal genealogical pedigree, too. I highly recommend joining 23andMe African Genetics Project. Remember it's FREE of charge. JOIN NOW HERE. Please note that you control your data and all of your information is secure. No blood tests or trips to the testing lab is required; it's a saliva (aka spit) test. Of course you should read the fine print (ie terms of service) and ask questions if you must by contacting 23andMe. I, and many of 23andMe's 1.5 million testers, can vouch that this company is notorious for protecting the privacy of its customers. 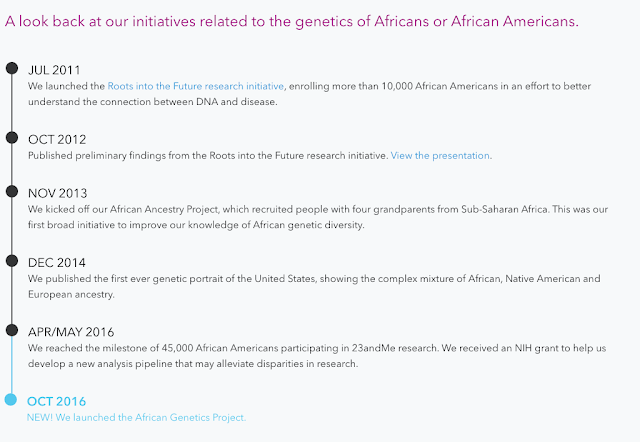 Don't delay, participate in the 23andMe African Genetics Project TODAY HERE.